In the days since two Americans were rescued after five months stranded at sea, experts have begun raising questions about holes and inconsistencies in the women’s stories. 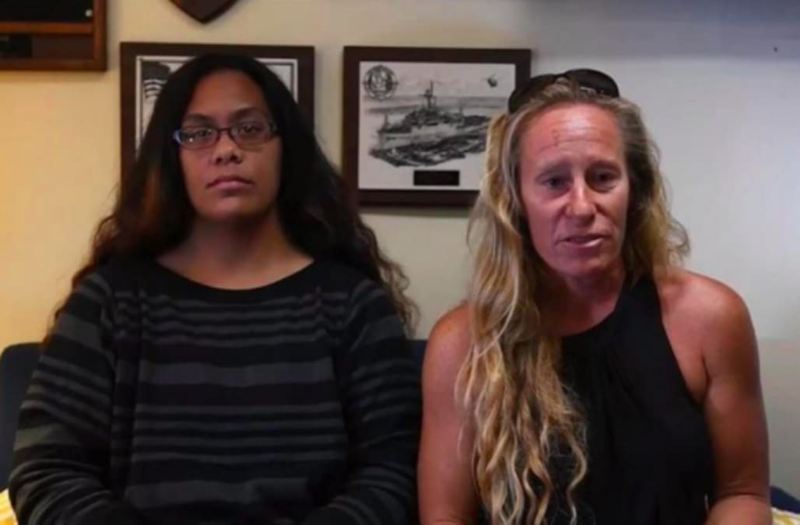 Jennifer Appel and Tasha Fuiava said they left Hawaii on a sailboat named “Sea Nymph” in early May and headed for Tahiti. The route is fairly common and takes about a month to complete. The pair said that after a piece of the mast broke and a storm flooded the engine, the vessel floated 5,000 miles off-course into the Pacific Ocean. Appel, an experienced boater, and Fuiava, a novice, said they braved ominous weather, shark attacks and faulty equipment before being spotted by a Taiwanese fishing vessel around 900 miles southeast of Japan and ultimately rescued by the U.S. Navy. PACIFIC OCEAN (Oct. 25, 2017) Tasha Fuiava, an American mariner who had been sailing for five months on a damaged sailboat, climbs the accommodation ladder to board the amphibious dock landing ship USS Ashland (LSD 48). Ashland, operating in the Indo-Asia-Pacific region on a routine deployment, rescued two American mariners who had been in distress for several months after their sailboat had a motor failure and had strayed well off its original course while traversing the Pacific Ocean. American mariners Tasha Fuiava, right, and Jennifer Appel, both from Honolulu, with their dogs Zeus, right, and Valentine, meet with USS Ashland (LSD 48) Commanding Officer Cmdr. Steven Wasson, center, and Executive Officer Patrick German in the captain's cabin. Ashland, operating in the Indo-Asia-Pacific region on a routine deployment, rescued two American mariners and their two dogs who had been in distress for several months after their sailboat had a motor failure and had strayed well off its original course in the Pacific Ocean. PACIFIC OCEAN (Oct. 25, 2017) A Sailor greets Zeus the dog with his owner Tasha Fuiaba, left, on the boat deck of the amphibious dock landing ship USS Ashland (LSD 48) after assistance was rendered to their distressed sailboat. Ashland, operating in the Indo-Asia-Pacific region on a routine deployment, rescued two American mariners who had been in distress for several months after their sailboat had a motor failure and had strayed well off its original course while traversing the Pacific Ocean. On Monday, it was revealed that the women had an Emergency Position Indicating Radio Beacon (EPIRB) aboard the ship but never activated the device. An EPIRB is a battery-powered device that works with satellite networks to get a distress signal to the U.S. government or Coast Guard as quickly as 45 minutes after its activation, Chris Edmonston, president of Boat U.S. Foundation, said. It can be manually activated with a switch, but will automatically activate if it hits water. After being rescued, Appel told TODAY that she “honestly believed that we were about to die within the next 24 hours." However, the Associated Press reported that Appel told the Coast Guard she didn’t activate the device because they never felt distressed. “She had stated they never felt like they were truly in distress, like in a 24-hour period they were going to die," said Coast Guard spokeswoman Petty Officer 2nd Class Tara Molle. In a statement on Tuesday, Appel explained why she didn't use the EPIRB, saying those calls are for people who are in imminent danger. "It would be shameful to call on the USCG resources when not in imminent peril and allow someone else to perish because of it. Every sailor knows that. Land people do not; so please do not allow the spin of ignorance to cloud good judgement," she said. "Had we known our calls were going nowhere — we would have used the EPIRB — but hindsight is 20/20," Appel added. Edmonston said Appel did a disservice by not activating the EPIRB during the trip because they passed by several points where rescue would have been easier. “She noted she set off flares where she saw ships so she was near shipping lines. Had she set off EPIRB, it would have been easier for a rescue,” Edmonston said. In her statement Tuesday, Appel defended her claim that nearby ships didn't see the flares she set off. "As for other boats not seeing our flares ... the other boats in the ocean missed the flares that were shot when the Titanic sunk, too," Appel said. The fact that the women fired flares at passing ships indicates they were in a situation that would have warranted an EPIRB activation, Edmonston said, though he added that everyone’s judgement out at sea is different. “If I was in a storm that had 50-foot waves, and I knew I had lost my engine, I’d be setting it off. If I was just drifting, and I could put up a sail, and I had electric power, and I had some idea where I was, I might keep sailing,” he said. The storm Appel and Fuiava described as producing 50-foot waves and flooding their engine is also a mystery. The National Weather Service records show no organized storms in the region in early May, the Associated Press reported. As the vessel floated out at sea, the women said they made distress calls every day using a very high frequency radio (VHF radio), which has a range of 25 miles. “The whole notion they called for 99 days on VHF is ridiculous,” Wilson said, adding that when the women passed by islands or other ships, the VHF signal would have been received. However, Appel said in her statement Tuesday that, unbeknownst to them at the time, their distress calls were only reaching as far as 1 to 2 nautical miles because of a faulty antenna. In June, the Coast Guard said it made contact with a ship identifying itself as the Sea Nymph near Tahiti. Its captain said that the vessel was not in distress and was expected to make land the next morning. According to the timeline provided by the women, their ship allegedly had already lost its engine and sustained damage at that point. Retired U.S. Coast Guard Captain Kyle McAvoy said that an investigation into the rescue will be undertaken to address any discrepancies, but said it’s possible everything will check out.